This little gizmo works but I found it too expensive, which is why I'm rating it fair. I had seen this product online for $10. One set includes 3 one-time-use stickers, 3 red flowers and their respective stakes. Good instructions also included. When I found this item for $3 at Tuesday Morning, I grabbed a set. 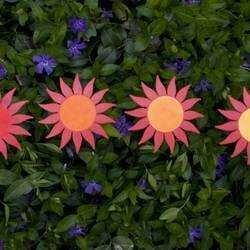 The set also includes a color guide to indicate whether an area is full sun, part sun, part shade or shade. I placed my stakes in areas that I more or less knew the degree of light, so you can say I was testing the gizmo. They worked, but so did my eyes, so unless one is truly clueless about the degree of light in a specific area throughout a 9 hour period, this is highly overpriced. As I mentioned, the disks can only be used once and a replacement pack of 3 disks costs $10. Too expensive, I say. 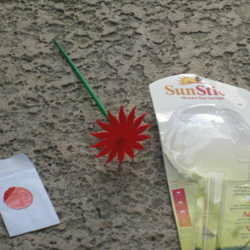 I wanted to add that you affix the sticker to the center of the flower, attach the stake to the flower, and place it wherever you want to test for sun brightness. The sticker reacts to the light (or lack thereof) and the color guide (included) allows you to evaluate whether sunny, shady or in between.